As part of efforts to increase the adoption and practice of organic agriculture in the country, the Organic Agriculture Project in Tertiary Institutions in Nigeria (OAPTIN) management team, from the Ibrahim Badamasi Babangida (IBB) University, Lapai, Niger State, a government-owned institution, recently visited the University to know more about organic agriculture. The team leader and the Deputy Vice-Chancellor, Administration, IBB University, who is also an alumnus of FUNAAB, Professor Mohammed Yakub, stated that the team members were on a study tour of organic agricultural facilities in FUNAAB, in order to improve on the existing system. Professor Yakub said that he was so elated with the level of rapid infrastructural development that he saw on campus, as he appreciated the efforts of the Vice-Chancellor, Professor Olusola Oyewole and his management team, for a job well done. While taking the team round facilities at the College of Plant Science and Crop Production (COPLANT), the Head, Department of Crop Production and a member of OAPTIN, Professor Jonathan Atungwu, said the team’s visit was home-coming for Professor Yakub, to his former Department, of which the study of plants is one of the core courses in the Department, saying that organic agriculture started from the College. The Dean of COPLANT, Professor Mufutau Atayese, represented by the Deputy Dean, Dr. Senjobi Bolarinwa, while welcoming the team to the college, said that without soil there was “no life’’, as he appreciated the immense contributions of organic agriculture. At the rice field experimentation, Dr. Olalekan Sakariyawo , took the team round the field experimental plot, where rice were planted and grown basically on organic manure. At the OAPTIN farm on campus, Professor Victor Olowe, the Director, Agricultural Media Resources and Extension Centre (AMREC), said the idea of OAPTIN was conceived in 2004 and the team members always had their meetings at the University of Ibadan, Oyo State. He stated further that a former Vice-Chancellor of the University, Professor Israel Adu, had directed that the project be established in FUNAAB. Professor Olowe disclosed that the project was mainly for capacity development, which involved interacting with farmers so as to build up their skills, adding that OAPTIN’s activities cut across the three arms of FUNAAB’s tripartite mandates of teaching, research and extension services. 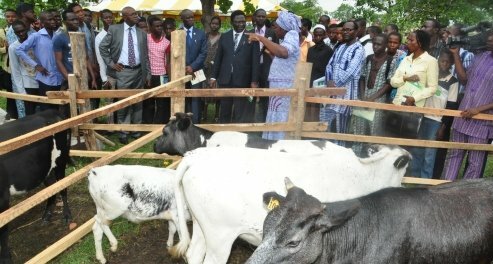 Professor Samuel Oluwalana of the College of Environmental Resources Management (COLERM), noted that Nigeria cannot attain food security without organic agriculture, as he demonstrated how the various plants that were grown on organic agriculture could be used for treating various ailments in order to have longevity in man. Other speakers at OAPTIN Farm include Dr. Florence Olowookere, who described how the different types of organic manure could be produced and applied on the farm. While receiving the team, the Vice-Chancellor, Professor Olusola Oyewole, has assured that the University would assist the network (OAPTIN) in realising its goals, noting that FUNAAB would also learn a lot from the Ibrahim Babangida University.